∞ Launched by Kering in April 2014 and organized in collaboration with the leading academic institutions HEC Paris and Tsinghua SEM, this training programme was specifically designed to meet China’s talent development requirements. 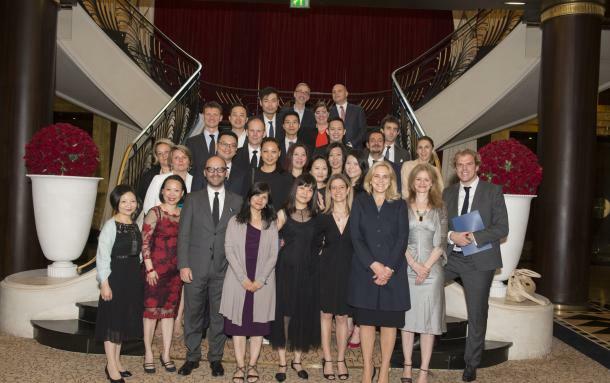 The ‘Kering Greater China – Leading talent through global perspective’ executive education programme ended on 5 June 2015 in Paris. The first class of 18 participants, from Kering and some of its brands operating in China, attended the closing ceremony at the Hôtel du Collectionneur in Paris. During the Gala Dinner, all participants have been awarded with a certificate from HEC Paris and Tsinghua SEM, also giving them access to credits for further executive programmes. Coming from Kering corporate functions in China and Kering brands operating in China such as Gucci, Bottega Veneta, Boucheron and Puma, the managers took part to a training articulated in three modules designed by Kering Human Resources team, jointly with Tsinghua SEM and HEC Paris. The first module was organized in Beijing in April 2014; the second one took place in Shanghai in October 2014; the final one, closing the programme, took place in Paris from 2 to 5 June 2015. Brand Management, Retailing and Distribution, Social Media, Intercultural Leadership – the training covered a wide range of topics designed to address specificities of the Chinese market and widen the participants’ perspective on their activity and business practices. On top of the three core modules, the executive programme included webinar sessions, team projects and various workshops to improve and adapt managerial skills to the changing dynamics of the Chinese market. During the final module in Paris, participants were thus able to experiment the power of creativity in leadership through the “Art of cooperation” Masterclass led by the conductor, artistic director and comedian Michel Podolak, in complete immersion in a rehearsal with the musicians of the Pasdeloup Orchestra. Kering’s ‘Greater China – Leading talent through global perspectives’ executive education programme stands among various talent initiatives launched in collaboration with Tsinghua SEM and HEC Paris by Kering or its brands over the years. The history of the School of Economics and Management, Tsinghua University (Tsinghua SEM) dates back to 1926 as the Department of Economics and to 1979 as the Department of Economics and Management Engineering. In 1984, Tsinghua SEM was established as one of the first business schools in China. Currently, Tsinghua SEM has a total of 165 faculty members and more than 4,000 students, offering a variety of academic programs at undergraduate, master (including MBA/EMBA), and doctoral levels. With seven departments and several research centers, Tsinghua SEM contributes academic knowledge that fuels the revival of the Chinese economy and cultivates business leaders for China and the world. Specializing in management education and research, HEC Paris offers a complete and unique range of educational programs f or the leaders of tomorrow: Masters programs, MBAs, PhDs, Executive MBAs, TRIUM Global Executive MBAs, and open-enrolment and custom executive education programs. Founded in 1881 by the Paris Chamber of Commerce and Industry, HEC is itself a founding member of ParisTech and Université Paris-Saclay. It boasts a permanent faculty of 110 professors, more than 4,000 students, and over 8,500 managers and executives in training each year.